Chan stars as detective Eddie Chan, a hot-headed cop who is assigned to protect a slumlord (Law) who has been receiving death threats. When Law's wife is kidnapped, Chan teams with the shady Hung (Cheng) to track her down. Based on a famous Hong Kong kidnapping case. 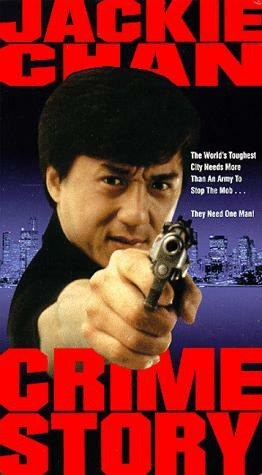 I originally picked up Crime Story thinking it was going to be another goofy cop action/comedy like Police Story. Boy, was I wrong. This is definitely one of Chan's most serious movies to date. The films kicks off with a couple of cops getting into a shootout with some would-be kidnappers, with Eddie rushing to their aid. He arrives too late and finds them shot up. Not the small squib type, but the covered in blood John Woo style. It's quite a change from his other movies where the violence always had a comedic edge to it. When people get hurt in Crime Story, it shows; there's no cartoony ability of the wounded to get up and fight again. Chan reflects this in his portrayal of Eddie Chan. While he's not up to the level of someone like Danny Lee with his portrayal of a serious cop, Chan puts in a suprisingly good performance. If you're expecting a lot of kung fu action here, then you'd better look elsewhere. Save for a fight on the rigging over a stage, Chan turns in his fists of fury for a six-shooter in Crime Story. The gunfights aren't extraordinary, but they are fairly exciting, and the finale reminded me a bit of Hard-Boiled (saving a kid from a burning building). A different side of Jackie Chan that's worth checking out. Note: the US version of Crime Story was changed slightly from the HK version, including omitting an epilogue at the end. From what I've heard, neither version is much better than the other. However, the US version is dubbed only, so if you're a purist make sure and hunt down the HK version.